Any fan of the Despicable Me movies has dreamed about having their own troop of zany yellow creatures to serve them just like Gru does. Now you can bring home your very own Minion courtesy of WowWee. Some of my daughters favorite toys including CHiP the Robot Dog, Fingerlings, and MiPosaur have been manufactured by WowWee with the Minion MiP Turbo Dave Balancing Robot recently joining that list. 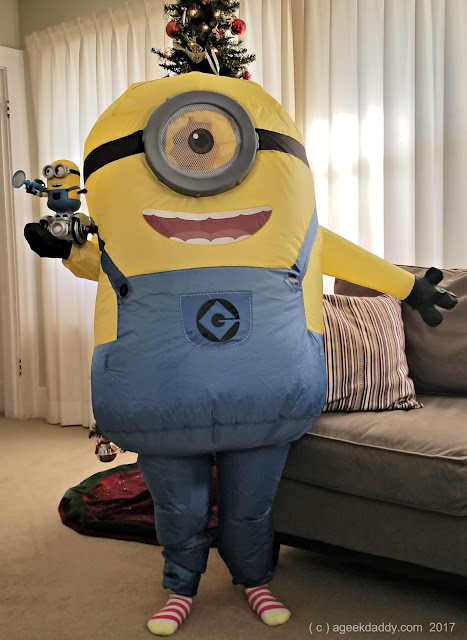 Minion MiP Turbo Dave brings one of the wacky minions characters from the Despicable Me movies to life in your own home. The toy incorporates a number of high tech features that provide for fun interactive experiences allowing your new loyal henchman to carry out all sorts of mischievous schemes for you. Accelerometers & gyroscopes allow your Turbo Dave to balance itself up right and whip around a room really fast while also allowing the robot to sense when it is being picked up. Capacitive sensor technology allows a Minion MiP to respond to being touched. Its sound detection system allows the robot to react to noises in its environment. Plus GestureSense allows your WowWee robot to respond to gesture-based interactions like swipes, claps, touch and more. So you can have lots of fun playing with Minion MiP Turbo Dave without the need of a remote control device! Expanding upon the controllability of Minion MiP Turbo Dave there is also a free downloadable app for Android and Apple mobile devices and phones that allows the robot to be controlled via Bluetooth. There are a variety of games, like Fart Battle, you can play with Turbo Dave accessible through the app. The Minion MiP also has more than 140 sound effects taken from the Despicable Me and Minions movie soundtracks which are a hoot to hear! Additionally the app has a coding option within it that provides a STEM learning aspect to the toy by helping teaching kids, or adults, how to program the robot themselves. 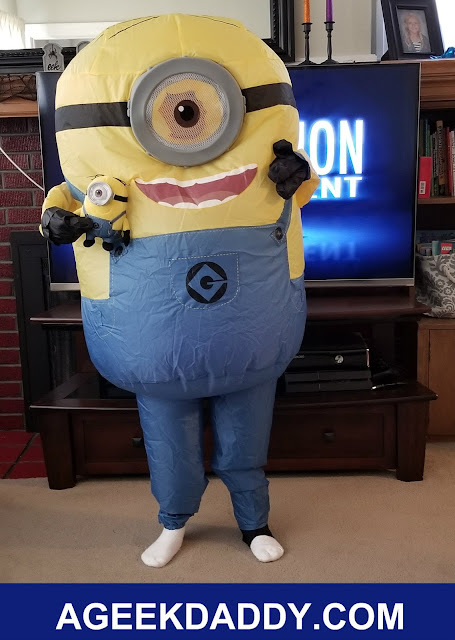 There is a whole lot to discover about Minion MiP Turbo Dave and exploring all its abilities and options is exciting. Being able to interact and control Turbo Dave both through an app as well as by gestures, sound and touch really enhances the fun of its interactive capabilities. This toy has been very entertaining and everyone in our family has enjoyed playing around with it! It is recommended for ages 8+ and requires 4 AAA sized alkaline batteries that are not included with the toy. 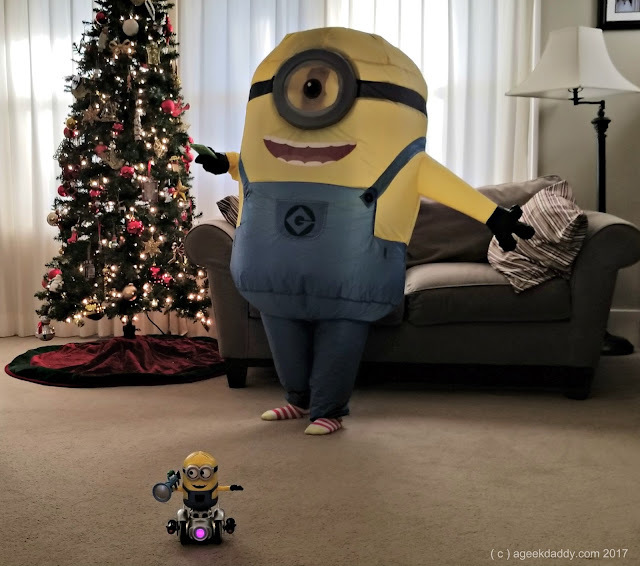 The batteries are the one negative aspect of the Minion MiP as it would have been nice to have a plug in rechargeable battery for all the use the toy gets from our family. Of course on the flip side of that critique is we've also like the product enough to be using it a lot. 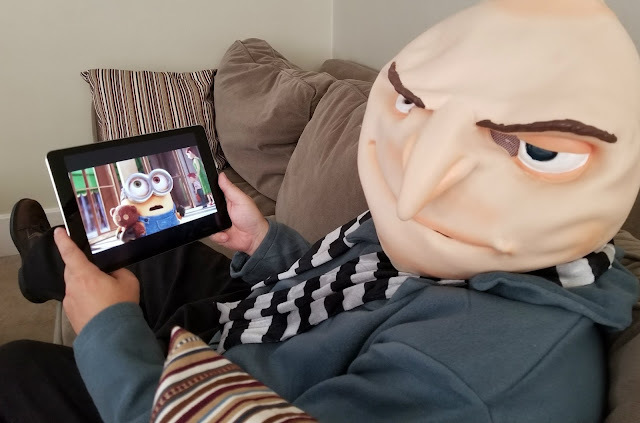 To get some inspiration for the antics and adventures we wanted to engage in with our new WowWee toy, we watched MINIONS on Movies Anywhere before playing with it. Movies Anywhere simplifies your digital video collection by providing access in one place to movies from multiple studios purchased or redeemed through a variety of retailers. Redeem digital copy codes found in eligible Blu-ray and DVD disc packages from participating studios or purchase a digital download of a movie directly from the Movies Anywhere app or website. Stream a movie to your television for a family movie night or download a film to watch by yourself on a mobile device. Watch your movie collection whenever and wherever you want with Movies Anywhere. Bello!!! Who is in the mood to watch MINIONS now? 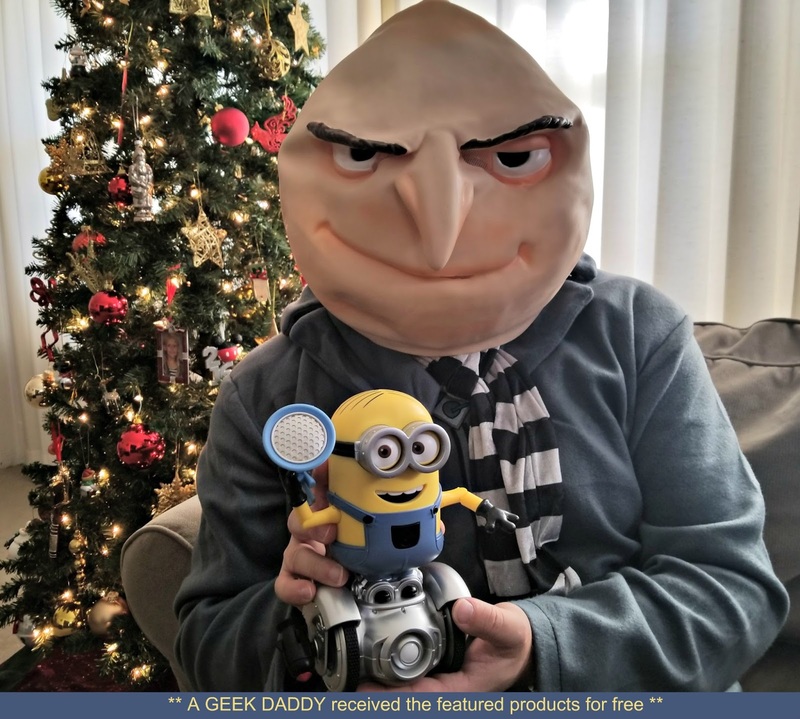 A Geek Daddy has a digital download code for MINIONS courtesy of Movies Anywhere to give away. For a chance to win simply complete the entries within the rafflecopter form below before 11:59 pm ET on Sunday, December 17, 2017. One lucky winner will be randomly selected from all eligible entries. Must be a United States resident over 18 years old to participate. A special shout out to Costume SuperCenter who provided the costumes that allowed us to get into character for this post. Costume Super Center has a great selection of costumes for both kids and adults to choose from. Looking for a Santa suit for a Christmas party, a Jedi robe to go see Star Wars Episode VII in, or some Minions inspired outfits to add some fun to a family movie night party? A Geek Daddy gives CostumeSuperCenter.com a thumbs up for affordable prices, quality products, and dependable delivery of your purchases right to your front door in a timely manner. Costume Super Center can provide extra fun to any occasion! It would be fun to get two or three Turbo Daves and race them around the house. awe lol my son loves the minions and gru !! Of course I love Steve Carell he is hilarious! I loved reading this blog post! The costumes are hilarious, what fun!! What would we do without Minions?